⚙ D4498 Only brushes with pinned materials have materials. Only brushes with pinned materials have materials. Authored by Antonio Vazquez (antoniov) on Mar 11 2019, 7:50 PM. Instead of repeatedly assigning one gpencil material to all brushes, every brush will use the active material unless a material was previously pinned to a brush. Using GP_BRUSH_MATERIAL_PINNED to switch between active material and brush material, instead of updating all brushes on active material changes. This will allow brushes to have no material and therefore to not inflate the user count. The material property in the topbar now switches between active material and brush material depending on whether or not the pin is activated. The brush material is not yet updated when the pin state changes. Removed an accidental printf statement. matc (matc) retitled this revision from Adjusting the user count for materials assigned to gpencil brushes. to Only brushes with pinned materials have materials..
matc (matc) added a reviewer: Grease Pencil. matc (matc) set the repository for this revision to rB Blender. Using the active material to pin to a brush. Keeping the different material properties in sync (topbar, properties->active tool, properties->material). 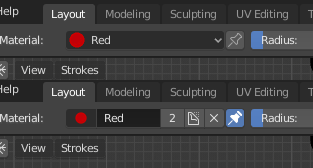 Switching in properties->active tool between active material and brush material. Notifying the material slots to update when a material had to be added before it was used. Antonio Vazquez (antoniov) added subscribers: Bastien Montagne (mont29), Brecht Van Lommel (brecht). I have tested and looks that all is working, but there are something I don't like. When you pin a material, the topbar changes and the look of the material is different. Also we have buttons for fake user, delete, etc and this is not a good solution for topbar. We need keep the same UI design when the material is pinned. I did a change to add the option "hide_buttons" in template_ID_preview. Maybe, we need something similar for template_ID (we would need this change in a separated patch and the review of @Brecht Van Lommel (brecht) and/or @Bastien Montagne (mont29) ) or maybe we need keep the template_list to keep the same look in the topbar. I see another possible problem. If you remove all materials and try to draw, the cursor moves, but nothing happens. Also, the topbar material is empty. One of the goals of grease pencil is to make the drawing simple, so if no material assigned, a new basic material must be created automatically. I think lib_link_brush needs to leave the material NULL if it's not pinned, so existing files do not have materials assigned without pinning. The reason behind the UI changes is unclear to me too. Maybe this logic can go entirely into BKE_gpencil_get_material_index(), since BKE_gpencil_use_material() does the same. Made BKE_gpencil_get_material_index return a zero based index and adapted other code to use the handle functions instead. Added BKE_gpencil_get_material_for_brush and BKE_gpencil_get_material_index_for_brush to have easy access to the actual material. I did not yet touch the UI again. I will have a look at it tomorrow and will try to make it always possible to draw. matc (matc) marked an inline comment as done. matc (matc) added reviewers: Antonio Vazquez (antoniov), Matias Mendiola (mendio), William Reynish (billreynish), Daniel Lara (Pepeland) (pepeland). Moved active_material popover to the right side of the topbar. pinned material. It will show the active material while not pinned. Added BKE_gpencil_current_input_material (with variations for toolsettings and brush) to obtain a material under all cirumstances. Yesterday I forgot to mention that lib_link_brush now drops materials for brushes without pinned flag. And unpins brushes without materials. When the material properties panel is open, brush materials appear to be created really slowly. This leads to a long delay when starting to draw without any material selected. As a result the first stroke begins with a straight line. I accidentally removed all reviewers yesterday and therefore am adding all back. Sorry for that. This is the result of the preview process and we need it to see how it's the material. @matc (matc) Could you update the patch with the last master source code? I can't apply it to test because something has changed since you generated the patch file. Updated diff to work with current master. Fixed user count for automatically created and assigned materials. I have found several compiler issues with VS2017. I don't see why we need to have two times the material in the topbar. We need fix the bugs, but need keep the UI as it was. @Matias Mendiola (mendio) What do you think? One material is a property of the brush, the other is a property of the object. @matc (matc) Yes, but we try to design a interface simple for new 2D animators. 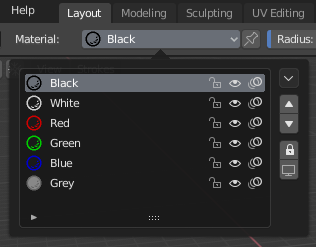 For long time Blender users the concept of Brush material and Object material can be easy to understand, but this is the type of thing we must avoid to get a "new user" friendly UI. I agree with @Antonio Vazquez (antoniov). The top bar is for tool settings related to the tool you are using. As such, just show the material for the active brush / tool. Exactly @William Reynish (billreynish) , material is related to the actual tool, and as @Antonio Vazquez (antoniov) said, we should keep the UI simple as possible. @William Reynish (billreynish) @Matias Mendiola (mendio) With this patch the material for a brush is NULL by default and the active material of a object is used instead, unless a brush has a pinned material. 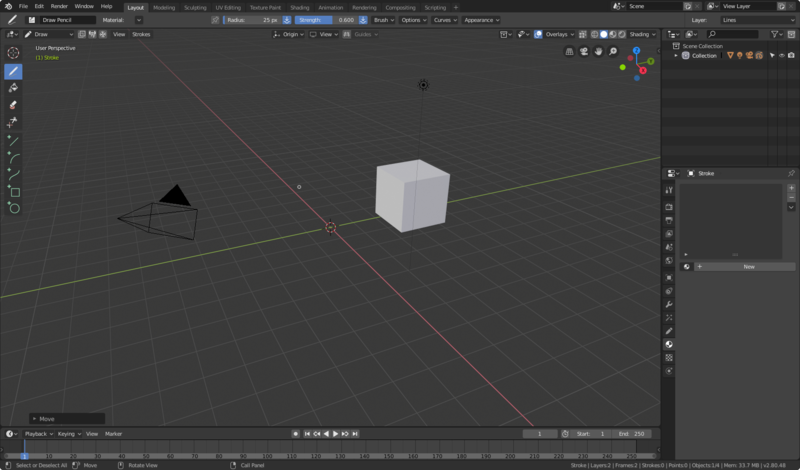 The material property on the right side changes the active material for a object, the same way as the layer property changes the current layer. Active layer and active materials affect all brushes. Before this patch changing the material for one brush would cause other burshes to update their material and change the objects active material. Changing the active material for a object would cause all brushes to update their materials as well. Brushes had essentially one button to change their own material as well as those of all other brushes. @Antonio Vazquez (antoniov) If we want to have only one material selector in the topbar, i would suggest to not display the material for brushes, unless a material was pinned from the properties panel or the brush popover. yes @matc (matc) , I know the goal of this the patch, and agree, but we can still keep the actual UI. 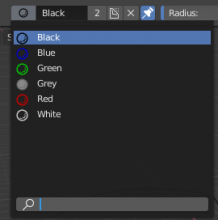 The material selector in the top-bar would change the object active material and if it pinned, the brush material should be used instead (like an override). Do we have another button somewhere that operates on one property of two different types? Or would this be a first? Moved to minimal changes in UI. I had to disable the property when not pinned. It would otherwise allow to change the material for the active slot. This should be as requested by @Antonio Vazquez (antoniov) @Matias Mendiola (mendio) and @William Reynish (billreynish) for the topbar. I'm not sure about the toolbar. I have tested and it looks this last version could work. We need the opinion of more reviewers. I tested this latest patch. For me the UI is ok, but I wasn't able to change the material on the active brush when Material Pin is enabled. I seem to have to un-pin, then change the material, then pin again. Can people confirm this? @William Reynish (billreynish) I can confirm that changing a pinned material in the topbar is not possible. We have the same problem currently on master. I tried to implement this before, but failed to get a consistent look for both cases. @Antonio Vazquez (antoniov) previously posted pictures of how it did look like. @matc (matc) Do you know if it's possible when change the material in topbar for pinned brush (current), unpin internally, change material and pin again? This would be only for the active brush if it's pinned. It's only an idea, maybe it's impossible. @Antonio Vazquez (antoniov) I don't think it's possible to distinguish between topbar and properties panel. I can only think of rna_MaterialIndex_update to do this. @matc (matc) review the bug I put above. In properties panel, the template_ID is not working because context.object is None. If you unpin, you will see the topbar brush panel is working, but the properties desn't. I have tested to disable the topbar list when the brush is pinned,. It's weird to clik on the list and don't change anything. Antonio Vazquez (antoniov) edited reviewers, added: matc (matc); removed: Antonio Vazquez (antoniov). @matc (matc) I updated the diff, command again the patch to update the diff (if you need to do it). @Antonio Vazquez (antoniov) The only thing remaining is the slow creation of new materials. But I guess this will be a new task. Looks otherwise good to be me. The creation of preview materials is something not related to this. To generate the preview, a render task is started on background, so to solve this we would need to start this background tasks before the user open the control, but this change affects other areas of Blender. For me, the patch is ready, but we will wait for more opinions, before applying it. @Matias Mendiola (mendio) @William Reynish (billreynish) @Daniel Lara (Pepeland) (pepeland) If you hve time, please check the last version of the patch. If all agree, we could move to master these changes next week. I think this is ok. It's a shame you cannot change materials if it is pinned to the brush, but I suppose that can be handled later. @matc (matc) Do you have commit rights? if not, you can ask for them or give me your mail to set the authorship of the commit to you. @matc (matc) does not have commit rights. To set the author of the commit we don't need an email address, but we do need a real name, and then you can set `"Firstname Lastname <matc>". @matc (matc) Can you give me your name to push the commit? @Antonio Vazquez (antoniov) @Brecht Van Lommel (brecht) Would it be ok to do it like for 2cc303700b65? I don't like the idea of being googlable by real name. Making one up does not seem right either. I would otherwise have no problem with @Antonio Vazquez (antoniov) claiming authorship. No, I'd rather not commit without a real name for the author. What Antonion can do is commit with himself as the author, and then in the commit message say "Patch contributed by matc". This comment was removed by Antonio Vazquez (antoniov).